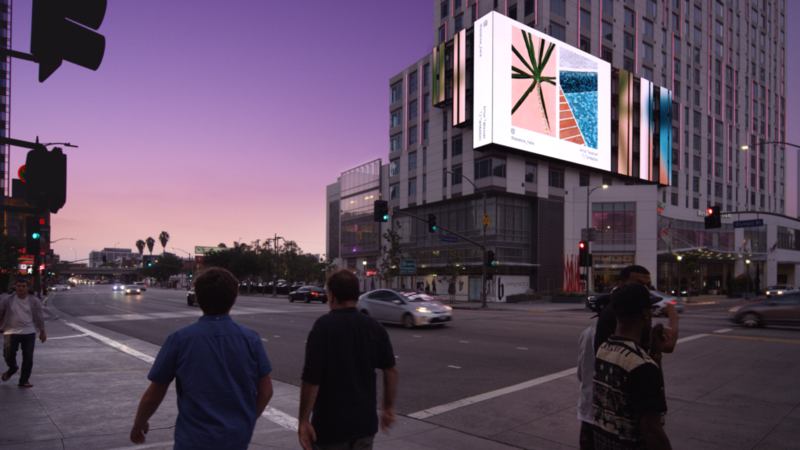 StandardVision has been working on some exciting new projects that introduce web-based content to the SVLA1 screen, which is mounted on the Marriott Courtyard building in downtown Los Angeles. Over the past month, we have started working with incredible Los Angeles artists on our new “Artist Takeover” project. Each week, we invite one photographer or artist to take over a recurring 15-second spot that publicly showcases their work. We developed a custom web app that enables us to compose the Takeover, preview it, and deliver it to the screen. The first of many Takeovers featured TJ Tambellini’s photography exploring vintage West Hollywood apartments. The second featured Izaac Enciso and his color theory-focused, abstract photos of Southern California. One of our goals at StandardVision is to find innovative ways to connect the public with local artists, galleries, and culture. We have worked with many incredible people to accomplish this goal, and there is much more to look forward to in the future. The SVLA1 screen is becoming an important cultural icon in this city. We are excited to keep it contemporary, showcase known and unknown artists, and engage this wonderful city in the art and culture for which it is famous.